Man, did I start late on this but I just finished a body of musical work for this year. Work I should’ve started in the spring at the latest. I could’ve been done around summertime if I did. Anyway, I still managed to come up with 8 brand new songs in a matter of 2 months! That’s a rarity for me nowadays. Plus I also reprised (did a remake of) 3 of my old songs from around 20 years ago! I performed these on a recent Wyoming Singer-Songwriter competition and thought the arrangement needed a makeover. For one, I could no longer hit the high notes like I used to back then so I had to sing them on a different key now. And play them on different instruments, as well! So, 11 songs recorded this year! Not too shabby for having just started this project in September. I have not had that many songs recorded in a year since 2005! Or 2004, if we’re talking original songs! As always, the album is quite varied in style. It’s the most diverse album I’ve ever made, actually! It’s called Ghost Notes. Check it out. I hope you like it. Good Sam – Friend or Foe? It’s a classic, yes? Most people are presumably familiar with the story. But what I’d like to briefly contemplate on is a view of this particular parable from an angle which I believe is quite easy to overlook. I know it is, for me. When Jesus told of this venerated tale, he made a case for all believers to pursue. He established a standard of righteousness through the likeness of a particular individual. He carved a hero out of someone whom the Old Testament-era Judeans considered not only a cultic half-breed but a downright outcast, as well. Or, a despised enemy, even. One might not realize it but in many levels, we, in today’s society, are no different at all. We desire to be heroes. We long to be inspired. However, we naturally look up to the usual suspects, don’t we? Our examples typically come from the ones that we’re able to relate to easily – our friends, our family or perhaps, even revered celebrities. But when do we ever seek inspiration from the ones we might consider outcasts or, quote-unquote, enemies? Think about it. It’s an issue of relate-ability. A matter of familiarity and comfort zones. It’s subtle but yet quite obvious, really. It can be about race, status or beliefs. It’s our perception of others. Our cliques. Our prejudices. The things we don’t enjoy talking about – because we are fearful of the subject matter and have nothing explicit to say about it. Unaware, we create invisible schisms, chasms and walls amongst each other. It’s a heinous misdeed and I certainly admit my own guilt! How compelling it truly is to behold Jesus’ upside-down ideology and how it instinctively goes against the grain of our fleshly perspectives and leanings! Surely, I am in constant awe! There is something astonishing and miraculous when we elect to pry our eyes open and witness the unexpected. The good within the perceived bad. Yes! To befriend a sinner; to plant a tiny seed of faith; to love as much as we’ve been forgiven; to knock in perseverance on God’s door; to find treasure in the unseen. Or yet, to simply be a good neighbor, just like Sam. Good Sam. It’s a great place to start, if you ask me. Discontentment. Ingratitude. If we’re truly honest, we’ll admit we all have these in us to some degree. They can be elusive, invisible or incognito even. A bit hard to spot at times. I don’t know about you but I struggle against it just about everyday. Even when I try not to show it, I can be a grouch deep inside. Sometimes, our choice between meat or manna can be a matter of life and death. It’s a tough battle. Choose wisely. Tomorrow, you little stinker you! Happy Monday. Here’s your Verse of the Day. Eat up! Okay, so I’ve probably nibbled on this little breakfast nugget more times than I can remember. It’s one of the most lionized passages in scripture and intrinsically embedded in my subconscious. Well, I hope so anyway. But you know how it goes: Just because you’ve read something once doesn’t mean you’ve wrung out every possible ounce of flavor from it. Well, a few moments after I’ve taken a quick and superficial gander at my phone, I couldn’t shake off a feeling that I might’ve missed something vital. Something that had been hiding in plain sight all this time! So I stopped what I was doing and sat for a moment. I read the verse a second time. Hmmm… possibly a couple more. But what I ultimately saw blew me away. Did you get that? Tomorrow will worry. Not me. Tomorrow will. Worrying is not my business. Not my monkey, not my circus! Nope! Whew! What a relief! Right? It says: Tomorrow will worry… about itself. Now, is it just me or is tomorrow being portrayed here as a bit ambiguous and problematic? Kind of a nutcase, if you will? Think about it. It doesn’t say that tomorrow will solve any of my problems. It doesn’t say that it will resolve anything at all or that it will eventually sort itself out. It only says that it’ll worry about itself! The funny thing is that tomorrow never really comes. It never arrives, does it? When you think tomorrow’s here, it’s already moved on. Okay, so if tomorrow is indeed ambiguous and problematic, then am I not crazy to even worry about it, to begin with? This is what I gather from all this: Jesus is saying not to worry because if you believe in him, the cares of tomorrow gets deleted from the equation and hope takes its place. As far as time is concerned, we are already there. Through hope, we are where we belong. In Him. And that, I believe, is nothing to worry about. Perfect Unity – Is that even possible? Some friends of mine and I were in a conversation a few days ago regarding unity. Oddly enough, we found ourselves in a dialectic disagreement. Forget about the context of the entire chapter. Just think about the magnitude of Paul’s appeal here on this particular passage. Not to the first century disciples in Corinth, but to you and me, and today’s Christendom. Is this even possible? Maybe so, but in all my life I have not seen proof of this ever being put into serious practice by anyone. It may have been attempted at one point or another but I don’t think anyone’s ever been persistently successful. Let’s just begin with all the denominations that have sprouted since the first century. Countless! The schisms, the factions. They’re endless. And this notion ranges from corporate to individuals. Paul wanted Christians to agree with one another in whatever they say. Now who’s word should we collectively concede to? If I say one thing and another says something else, who do we yield to? And how does pride and humility play into this? No divisions! If this is the law, then we’re all guilty of breaking it. Being the inherent sinners that we are, there’s just no way we could’ve avoided this infraction on any level. I may be wrong (and I hope I am), but I have yet to see otherwise. And the final appeal… to be united in mind and thought. And perfectly at that! Indeed, Jesus! Increase our faith! I can’t even begin to unite my own mess of thoughts, let alone be perfectly united with those of others. Most of whom I have nothing in common with other than a fundamental faith in God. I don’t mean to sound bleak, but we do have work to finish here. Seemingly insurmountable kind of work. After 2,000 years, we’re barely scratching Christianity’s surface. If at all. It seems distant, yet it’s near. It feels far away, yet it’s here. It’s a promise. It’s my hope. And hope does not disappoint. Yes, we skipped Valentine’s Day. I confess that I’m really not as big a fan of the occasion as most people are. Too commercial for my taste, I guess. I would much rather do something special on a different day. When it’s least expected. So on a whim, my wife and I decided to celebrate the following weekend instead. 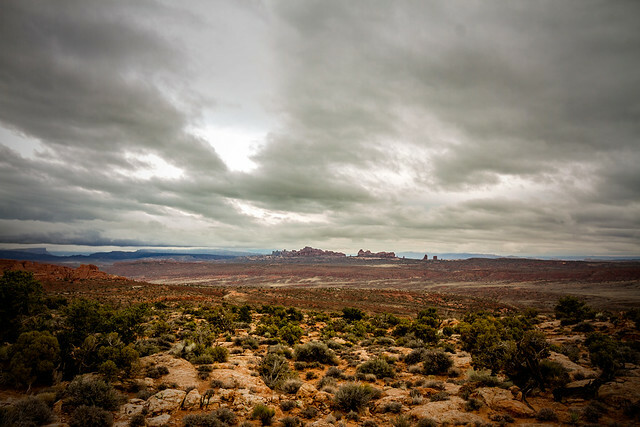 With a trip to Moab, Utah! Incredible! Now, that’s what I call romance. LOL! All in all, a great time was had. Can’t wait for the next adventure. 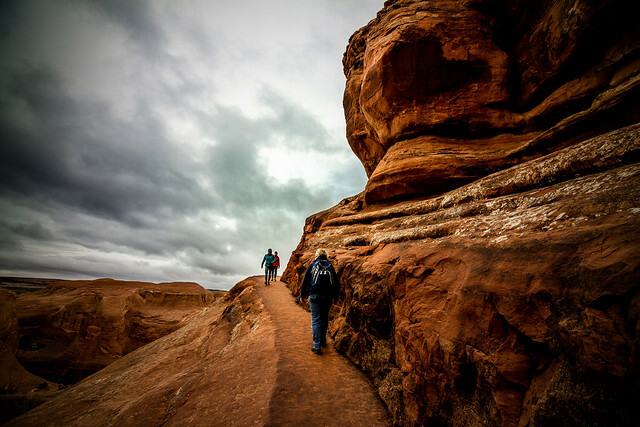 The photo above was taken on a hike towards the Delicate Arch in Arches National Park. We also went to the Moab Giants Dinosaur Park. A great place to visit for kids of all ages! Check out some more pics from the trip over here. There was a post on Facebook I read yesterday about the reality of loss and how life goes on without stopping for even a moment to mourn with you. It is a hard thing to swallow sometimes. From my own experience, you really never stop caring for someone you’ve invested so much of your heart on. You don’t stop missing them either. Those people that have touched your life and made a difference in you. They may not be here anymore – perhaps due to divorce, death or life simply steering you separately into different directions – but they will continue to be a part of who you are until the end. I remember my best friend in school, my first wife and some close relatives. I still feel the same way towards them, as I did in the beginning, even when we’ve already gone our separate ways. The love I had for them will always remain even when my life now is so much better. I am blessed to be who and where I am now and a big part of that is due to the fact that certain people have made me that way. I believe that loves never leaves. It is pure. It is organic. Sure, it may sometimes be stagnant, or maybe in hiding… but it’s always there. If it feels like it went away, it may not have truly been there at all. It could have been something else… but certainly not love. Love happens. But it shouldn’t have to go on. The other night, my wife and I were watching TV and out of the blue I asked her a question. Never mind what it was. My point is that her answer didn’t sit quite right with me and it got me all flustered. It happened a couple more times during that same hour. Finally, I couldn’t handle it anymore and I started to raise my voice in protest. The next thing you know, we’re at it. Just like in the presidential debates, we both were spitting words out like broken arrows. Like empty bullets. Utter nonsense! We were trying to validate ourselves by squelching each other every which way we could. I was mad. She was mad. For a moment, we were both helpless. I’m a little embarrassed to write about this now but in my experience, transparency heals the soul. I don’t want my emotions to rule over me. I want to respect them. To accept them. But to rule over my desire to do the right thing? No. In anger, nothing right, or righteous comes out of the mouth. In a relationship, anger can make us unhinged. Detached. An enemy of each other. I know I have to fight inwardly every time. I have to fight for her. For us. For what’s right. And winning this fight means you have to feel the other person’s pain more than yours. It’s the only way to develop compassion and a way out of the mess. Being a prideful soul that I am, it took all of my being to muster enough strength to stop this madness before we had to go to bed. I did not want us to sleep through this, I thought. So I apologized. And hoped for the promise of better days. And that was it. Pain relinquished. Joy restored. In the end, what matters is that I love her. Who’s right? Not so much.